For over 100 years The Plaza has been the New York hotel to see and be seen. Kings presidents and stars of stage and screen have all gathered and stayed at The Plaza. The most lavish social affairs as well as classic Hollywood films have all used the legendary hotel as their setting. Located at Fifth Avenue and Central Park South this luxury hotel was constructed in the most fashionable residential section of New York City. From its original 19th century construction to its magnificent 450 million dollar restoration in 2008 the worlds most famous hotel has had a remarkable history. While traditions remain such as the opulent grandeur of the Beaux-Arts decor and the iconic Afternoon Tea in The Palm Court exciting new offerings at this legendary hotel include the elegant Champagne Bar the stylish Rose Club The Todd English Food Hall and The Plaza Food Hall. The Plaza Hotel offers 282 distinctive guestrooms - including 102 luxurious suites - which boast the largest square footage of any luxury hotel in New York City. For suite guests The Plaza is pleased to offer Butler Service 24 hours a day. Amenities at The Plaza include the world-class Shops at The Plaza as well as health and wellness facilities including Guerlain Spa Warren-Tricomi Salon and LA PALESTRA gym. Carved from within the great castle-like landmark it is The Plazas magnificent public spaces that set it apart as the quintessential grand palace. 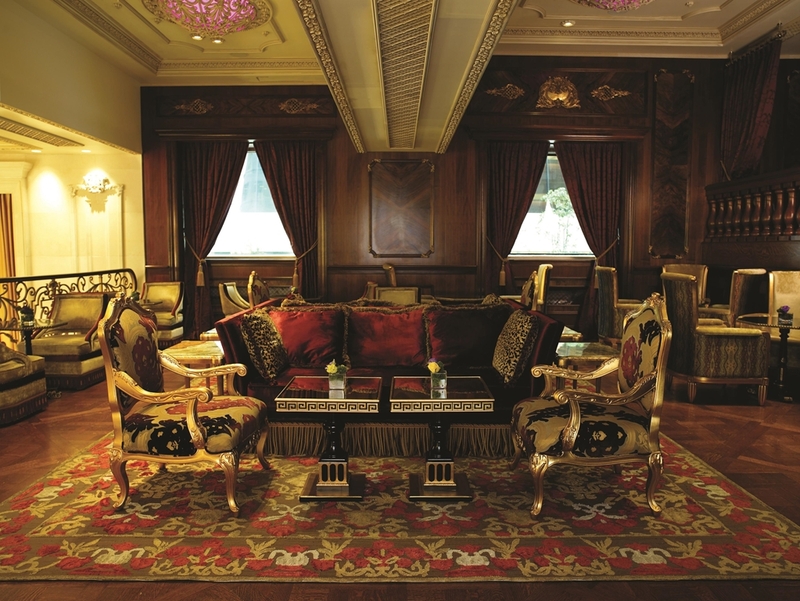 The opulent Grand Ballroom and Terrace Room have been meticulously restored to their original grandeur. Lavish social and business events and unforgettable weddings continue to be held in these historic landmarks which are at the heart of The Plazas legacy. The Palm Court: The Palm Court is The Plazas iconic dining venue, serving breakfast, afternoon tea and an evening service complimented by the recent addition of a bar and craft cocktail program. The Oak Bar - Temporarily Closed: Overlooking the vibrant views of Central Park South, Oak Bar at The Plaza is one of New York Citys most iconic institutions. The Oak Bar be will re-opening shortly and live up to its iconic reputation as a New York City institution. Quite simply the worlds best address, 59th Street at Central Park South, located across the street from Central Park, on Fifth Avenue, in the heart of the Midtown shopping district. Steps from over more than 1000 corporate offices. Short walk to Times Square, Lincoln Center, Columbus Circle. Public transportation N R W Q lines stop at The Plaza. On Grand Army Plaza next to the Pulitzer Fountain and Sherman Monument. CARRIAGE RIDESHorse Carriage rides through Central Park are available year-round and are one of the most romantic and popular ways to see Central Park. The carriages can be found lined up along Central Park South -59th Street between Fifth and Sixth Avenues. CENTRAL PARKLocated across the street from the hotel- Central Park covers 843 acres- which is 6 pct. of Manhattan. See also Carriage Rides. METROPOLITAN MUSEUM OF ARTThe Metropolitan Museum of Art holds the worlds largest and finest art museums with more than two million works of art from prehistory to modern day. METROPOLITAN OPERAMake it an evening at the Metropolitan Opera and witness some of the most talented singers in the world as they take on to the stage. NEW YORK PUBLIC LIBRARYProudly encourages use of its beautiful and majestic rooms as unique and memorable settings for special corporate events- business meetings- and conferences. Multilingual staff. RADIO CITY MUSIC HALLUniversally acclaimed as an architectural triumph- Radio City Music Hall- in historic Rockefeller Centre- is one of the entertainment world*s most appealing and exciting venues. Radio City Music Hall has undergone an unparalleled restoration. ROCKEFELLER CENTERLose yourself in the 200 shops- services- restaurants- gardens- sculpture- murals- music and entertainment of Rockefeller Center. Home of the renowned Radio City Music Hall. ST. PATRICKS CATHEDRALRevel in one of the finest examples of the Gothic-style in the United States- the magnificent St. Patrick*s Cathedral.The Gothic Revival architecture took 27 years to complete and is imitative of the cathedral in Cologne- Germany. STATUE OF LIBERTYStatue of Liberty is Open to the Public with certain restrictions.Only some areas of the grounds of Liberty Island are open for visitation. The statue cannot be climbed. UNITED NATIONS PLAZALocated at First Avenue at 46th Street Multilingual guided tours featuring General Assembly Hall- Council Chambers- works of art from member nations. Gift shop- bookstore- restaurant- stamp counter- exhibits.